The study focused on nearly 1,000 children with critical illnesses at a hospital in Columbus, Ohio. Half of these children had wishes granted, and half had not. In the end, the children who had been granted wishes were substantially less likely to visit the emergency department or to have an unplanned hospital admission within two years. Summer means FREEDOM, FUN, and ADVENTURE at Shining Stars! Summer is coming! Do you remember a more exhilarating feeling than the last day of school as a kid? Summer is a magical time for children all over the country. Kids get to spend more time outside, more time with friends and family, more time just being kids. Unfortunately for so many of our Shining Stars, there is no time-off from cancer. While school is out, they are still required to endure hours of treatment inside at the hospital, even on the sunniest summer day. They might not have homework, but the life-saving medicine that courses through their veins makes them feel nauseous and ill - that's a feeling they take home even when they leave the hospital. Chemotherapy and radiation make skin much more susceptible to sunburn, so parents are even wary of letting their kids play in the sunshine for too long. Toput it lightly, cancer can be a real summer bummer. At Shining Stars, we take back the summer for our Stars. To us, summer means adventure. It's all about spending time outside in the Colorado wilderness. It's about splashing around in cold lakes and rivers. It's about climbing up on that horse and taking it for a ride, even if you were afraid at first. It's about finally catching that fish you've always wanted to catch, or hit that golf drive straight as an arrow. It means bundling up by a campfire with your family when the day is done. With our expert medical team on site, we make it possible for pediatric cancer patients and survivors to discover the wonders of summer again. We can't wait to do it again in Summer 2018! Caleb attended Winter Games in the spring of 2015. A 15-year-old from Aurora, Colorado, Caleb suffers from an optic glioma, a tumor of the nerve to the eye. This form of tumor often occurs as one of the central nervous system manifestations of Neurofibromatosis 1, which Caleb is also challenged with. He is essentially blind in his right eye, and is rapidly losing vision in his left eye each day. Facing these debilitating illnesses as an adolescent, a time when even healthy teens struggle with drastic emotional and physical changes, is no easy feat. Caleb suffers from decreased motor control, compromised balance, hearing, a lack of energy and some learning delays. In the face of all of these challenges, Caleb chooses to laugh. This amazing young man brings bright light and energy to every room he enters, armed with a half dozen jokes at any given moment. Caleb also enjoys writing- he has even published his own book about sharks! At Winter Games in 2015, he composed the following poem, and share it with all of us on Banquet Night. The Skiing Poem by Caleb S.
one way I can really be me. that makes me feel free. these things, you can't have too much. a sit-ski is like a mountain boat! having a blast under the sun. Do I regret going down the hill, then back up the slope? All I have to say is, "NOPE!" Offering children like Caleb a chance to feel like themselves again, to feel free, is one of the many reasons that Shining Stars exists. We recognize the tremendous struggle that these children have been forced into, and seek to acknowledge the sheer energy that it takes to wake up each day and fight their battle. In return, we seek to give these children HOPE- to show them all they are capable of doing and reflect the inner strength we see shining so bright beneath the surface. Will you help us show children like Caleb what it feels like to be free? Will you help us remind these kids what living truly feels like? Sponsor a Shining Star today. Click here. Ta’Quaja was diagnosed with a brain tumor in December 2014. She underwent an aggressive treatment plan that included brain surgery, chemotherapy, and radiation. The grueling treatment left Ta’Quaja feeling isolated from her peers, so she was nervous to attend the 2016 Aspen Winter Games with nearly 70 other kids. Those nerves didn’t last long, though! From ski-biking Buttermilk Mountain, to strutting her stuff at the talent show, to giving all her new friends hilarious nicknames - we loved watching Ta’Quaja’s confidence blossom during the week! Hospital stays, radiation, chemotherapy...my life revolved around treatments. Shining Stars gave me the opportunity to ride in an airplane for the first time, meet incredible people who motivate me to do more, and visit a state I’ve never been to. And I got to ski, which I’ve never done and made me feel like a champ no matter if I went fast or not. Your support will enable us to serve brave kids just like Ta'Quaja. Click here to learn how you can change a life today! Help us kick off the charitable giving season with #GivingTuesday, a global day of giving! 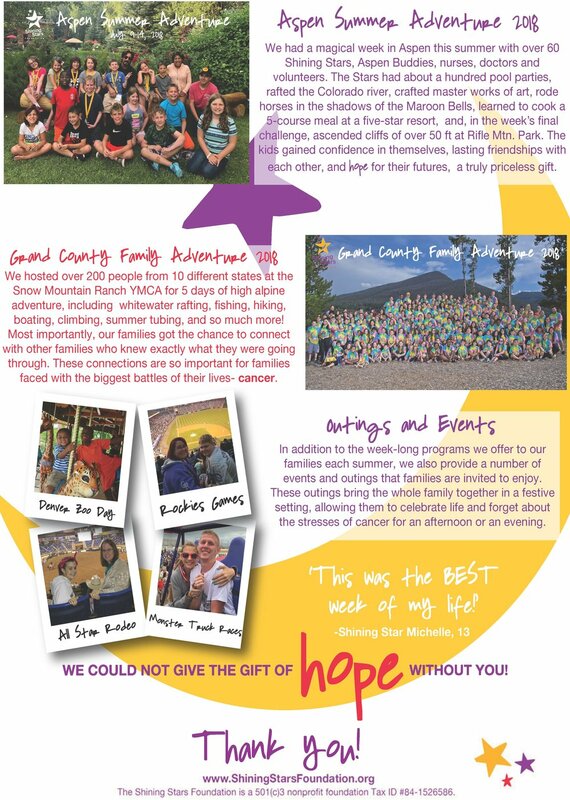 You can give the gift of hope this holiday season to children and families facing pediatric cancer. ...the list went up to 50 items! Joshua's mother explained to us the significance of this list. "When he was told that he could go [to the Aspen Winter Games] by the Phoenix Children's Hospital staff, he went home and grabbed his list..... his “BUCKET LIST” and said “look mamma, I get to scratch two things off my list”. Tears filled my eyes and for the first time in Joshua's life, I saw him experience REAL HOPE by believing that he was finally going to get the chance to be a “NORMAL BOY.” Thank you for giving my child Joshua Hope. And, I pray that many more children get to experience the life changing event as Joshua did." Thank you for helping us bring HOPE to the lives of children across the country! Will you give this year to bring hope to more brave kids that need it? Visit the Shining Stars donation page and give what you can today! The story above is just a glimpse into the life of a child battling cancer. A life of growing up too fast, dreading the next needle poke, and feeling isolated and alone. This is where you can step in. With the help of supporters like you, Shining Stars brought Kaity to the Aspen Winter Games program. She spent an entire week skiing and forming unique friendships with other children who knew what she was going through. She forgot all about her cancer, and the painful treatments that she endured before leaving home. She found acceptance among a group of peers who had also experienced the trauma of battling cancer. She was reminded that her cancer will not define her life. She discovered the joy of simply being a kid. Now Kaity tells us, " I will never give up hope!" After the Aspen Winter Games, Kaity and her family were invited to over 60 other programs and events. She is now in remission, but often attends programs with her family to help mentor and support newly diagnosed kids and families. This would not be possible without supporters like you! 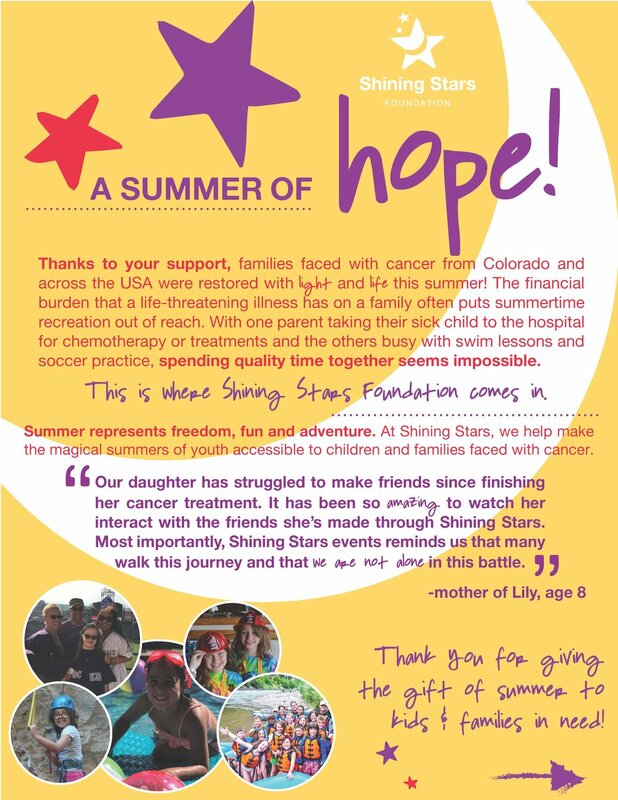 You can make your tax-deductible donation by going online to www.ShiningStarsFoundation.org/donate or calling us at 970-726-8009. Thank you for giving the gift of HOPE! Meet Kat. Diagnosed with a malignant tumor of her eye socket, Kat underwent chemotherapy and radiation therapy as a toddler. The treatment left her with a number of lasting effects – both physical and emotional. Kat was invited to attend the Aspen Winter Games. There, she found a network of friends who knew what it was like to have cancer. To endure hospital stays, needle pokes, and surgeries. To be labeled as ‘different’. Kat and her family now attend many of our 60 year-round programs and events. Help us bring hope to brave families like Kat’s this holiday season! Make your donation go even further with Colorado Gives Day. This annual statewide movement celebrates and increases philanthropy in Colorado through online giving, and its $1 Million Incentive Fund increases the value of every donation proportionally. Colorado Gives Day is December 6th, but you can donate early! Click the button below to learn more and bring hope to children and families facing cancer or another life threatening illness.